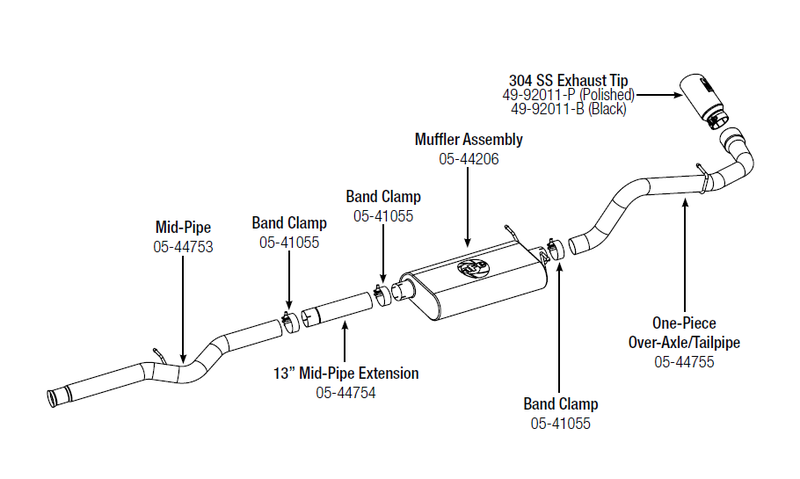 Step 1: (Read Instructions prior to installation) Remove your stock exhaust up to the catalytic converter from the rear of your truck working your way forward. Take caution not to damage the factory hardware and isolation mounts as they will be reused. It is recommended to not fully tighten the clamps until the entire system has been installed. Step 3: Install the midpipe adapter. Slip band clamp over expanded end of the mid-pipe prior to installation. When using the flared midpipe adapter, you will need to re0use the original band clamp. You will have to release the locking tab with a small screwdriver. This is best done after removing the stock exhaust. Now install the mid-pipe. Step 4: Slip band clamp over expanded end of muffler prior to installation. Now install muffler onto mid-pipe and rubber isolaters. • aFe recommends that the tailpipe be at least 1/2”-1” away from any body panels to avoid heat related body damage. Tighten and secure. Caution: Allow time for your vehicle to cool down prior to installation. When working on or under your vehicle proceed with caution. Exhaust systems reach high temperatures and may cause serious burns. Wear protective safety equipment; eye goggles and gloves to ensure a safe installation. aFe recommends professional installation on our products.